The draw was made today for the first round of the FA Trophy and out of the hat for us came a choice, one that should be resolved tomorrow evening when the victors of the replay between Worksop Town and Vauxhall Motors FC will be decided. They fought out a 2-2 draw at a rain soaked Rivacre Park, Ellesmere, on Saturday with one of the Worksop goals coming from former Harrier Lee Thompson. 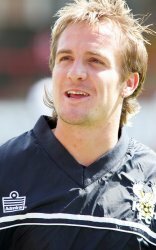 He joined them during the close season after his release from KHFC. The game will be played at Aggborough on December 16th with a 3:00pm kick off. The date of any possible replay is not yet known but be warned that if we eventually play Vauxhall and the game goes to a replay then there is no cover whatsoever at Rivacre Park after the local council condemned both of their stands. The remainder of the draw is below. Northwood or Histon v Cambridge United.